Home » James Jordan: Vaudevillian — A Fun Show for Kids of All Ages! 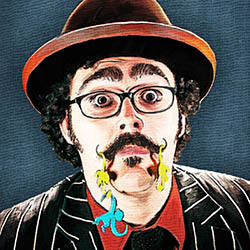 James Jordan: Vaudevillian — A Fun Show for Kids of All Ages! James Jordan: Vaudevillian is billed as family-friendly, and James Jordan delivers on that promise in spades! It’s a magical comedy show for more than just the kids—the adults in the audience were certainly having a fabulous time watching card tricks, trying to understand how sleight of hand is faster than the eye and being amazed by a man who is willing to let live mousetraps snap onto his fingers. His expressions alone are enough to make you laugh out loud! We enter the theatre to see James Jordan vamping upbeat tunes at the piano. He welcomes us to the show, then proceeds to add a live musical accompaniment to the Fringe Festival announcement (which is truly the best way I’ve experienced yet to listen to that recording). He introduces himself and proceeds to wow the audience with nonsensical songs, outrageous balloon hats and a wee bit of mentalism. Along the way, he gets children from the audience to volunteer to help… and they do, with an enthusiasm that only those younger than ten can provide at the drop of a hat. As I watch the show, I realize that a lot of this type of magic show requires the magician to be like a stand-up comedian. You have to be able to deal with hecklers, a crying baby or two, and unexpected audience volunteer contributions. All that ability comes from a lot of experience, which clearly underlies this well-polished performance. In James Jordan: Vaudevillian, he is not only keen to show us his magical illusions but also highly skilled in integrating what’s happening around him into the show.